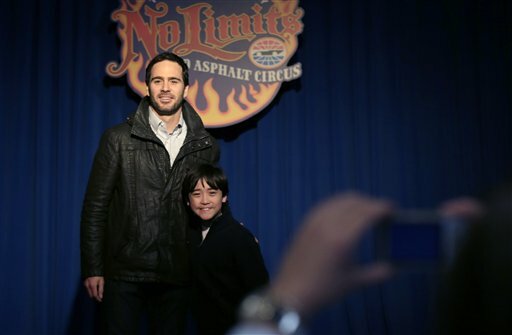 DALLAS — Jimmie Johnson will have covered all four time zones and five states on his Daytona 500 victory tour by the time he climbs in the car for the first of two races in Phoenix this weekend. To the victor go the toils, although that’s hardly the way the five-time Sprint Cup champion view things. If Johnson was feeling a little road weary, maybe a pep rally with primary sponsor Lowe’s will help. There was double cause for celebration Wednesday night in Las Vegas after Johnson’s Hendrick Motorsports No. 48 team announced a two-year extension with the only primary sponsor Johnson has ever had. The new contract runs through 2015, and the announcement happened to coincide with a major sales meeting. The Daytona victory celebration started with an impromptu Harlem Shake video, followed by the early Monday morning ritual of turning in the winning car for display at the Daytona track. Then it was on to Connecticut for part of a day, and New York overnight for a full day of media engagements Tuesday. Johnson and his publicity team landed in the Dallas area Tuesday night, and he was back at it Wednesday before hopping a plane to Vegas. He’ll be in Los Angeles on Thursday before finally getting back to the business of racing Friday. He’s running the Nationwide race Saturday and will be trying Sunday for a series-best 62nd victory since his rookie year in 2002. After his first Daytona victory in 2006, Johnson remembers the following week as busy. Just not quite this busy. By the time he gets to Phoenix, Johnson will have a lot of catching up to do. He says Tuesday is normally “download” day, when he goes over the previous week and looks ahead to the next one with crew chief Chad Knaus and the rest of his team. Instead, he was chatting up David Letterman. Knaus doesn’t really feel the need to cut his driver any slack. Johnson’s first Daytona win sparked the first of five consecutive championship seasons through 2010. He had no way to compare a Daytona win and a series title then. Now that he can compare, he better understands the scope of a win the so-called Super Bowl of NASCAR. Johnson doesn’t have to tell any of that to Dale Earnhardt Jr., the 2004 winner and Sunday’s runner-up. While nothing’s bigger than winning at Daytona, Johnson’s contract extension with Lowe’s Companies Inc. is an important early-season development in what was otherwise shaping up as a contract year, something drivers always hope to avoid. Johnson and Lowe’s will be partners through at least a 14th season in 2015.